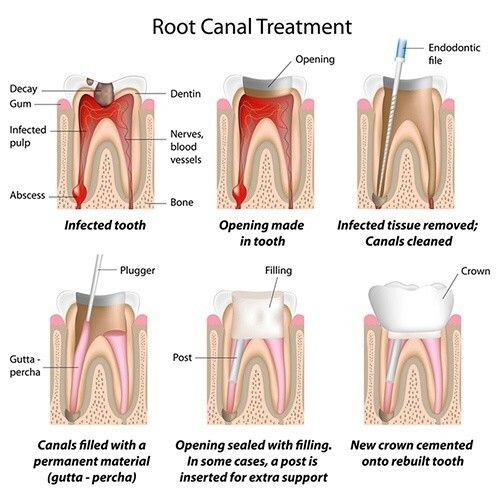 A root canal treatment, also called endodontic treatment, is a dental method to treat infections in the tooth’s inner part, the pulp or nerve of the tooth. The pulp is the “heart of the tooth. 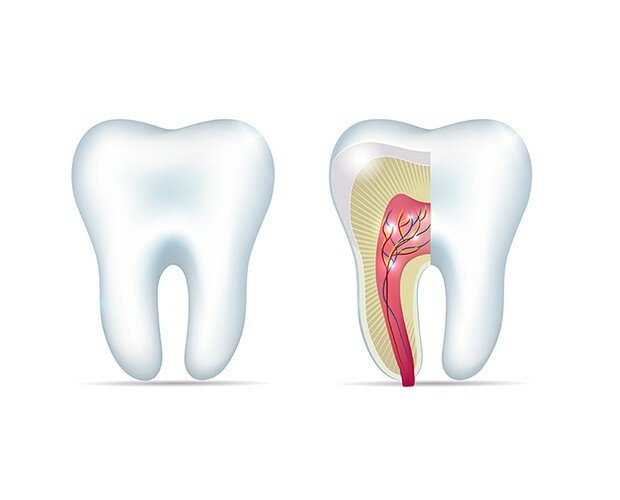 It consists of nerves, blood vessels and connective tissue, which all fill the tooth canals, stretching from the root of the tooth into the crown and back. The pulp keeps the tooth alive. For various reasons, such as severe caries or leaky fillings, this pulp may be inflamed or infected. During a root canal treatment the pulp is removed and the inside of the tooth is carefully cleaned, disinfected and filled with gutta-percha, a rubber material which will keep the canals free of contamination and infection. That way the tooth does not need to be extracted but can be saved. When you make a root canal filling, you start by opening up the tooth entirely, to search for the canals. The number of root canals may differ from tooth to tooth, from 1-4 canals in one tooth. It is important to find them all. When the canals have been localized, they will be electronically measured, to make sure that the filling will cover the whole canal from root to end of crown. The canals will be cleaned using files. They will be rinsed with an antiseptic solution and finally filled with gutta-percha. The final stage of the root canal filling is to provide the tooth with a plastic filling or a crown, depending on how much of the tooth substance was lost before the root canal treatment. A root canal treatment may also be split into two parts, cleaning and filling. Especially, if the bacteria infection covers the surrounding bone material as well, which will give pain from both areas. We will then use an antiseptic agent after the canal cleaning. A temporary filling will be made, to be followed by a healing period of at least one week. We will continue the treatment with the second part as soon as a successful bone healing has started, ending with an individually adapted tooth filling.